Jaś Kapela before a judge. Featured image by Jakub Szafrański. 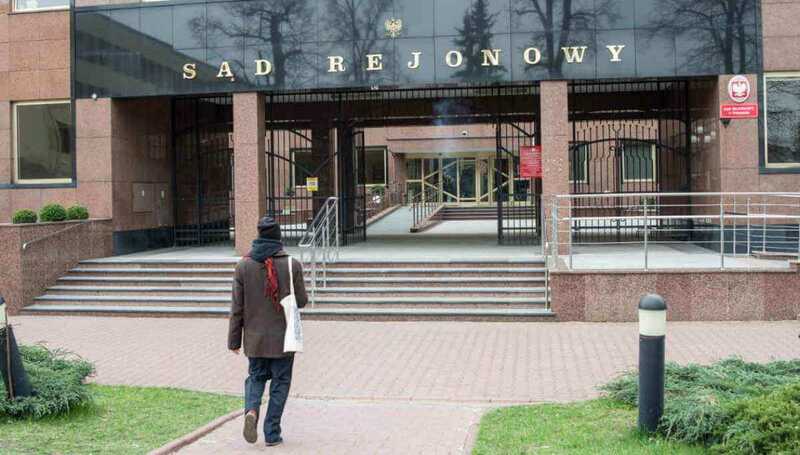 My only choice is to appeal to the European Court of Human Rights in Strasbourg – says Jaś Kapela, a poet and a writer for Krytyka Polityczna. In October 2016 he was convicted of misdemeanor by disrespecting the national anthem by altering the lyrics. During his appellate hearing, he argued that by altering the words of the anthem he wanted to take part in the public debate on the Polish government’s refusal to accept any refugees. 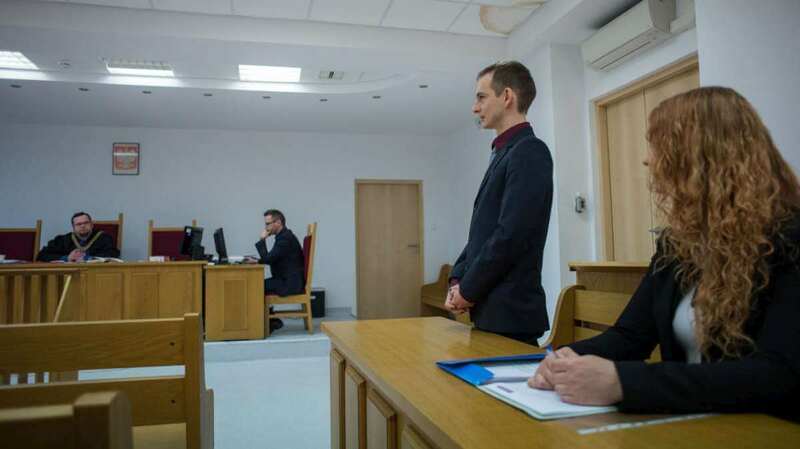 The sentence has recently been upheld by the appellate court and Kapela has to pay a one thousand zloty fine. He wanted to take part in the public debate on the Polish government’s refusal to accept any refugees. The changed lyrics are hardly disrespectful, however. They begin with the statement that Poland is not a poor country anymore and that for this reason it can welcome refugees from Syria and other war- and poverty-stricken places. Kapela argues that the anthem itself is very appropriate to be used for such intervention. The lyrics were written in 1797 in Italy by a Polish soldier who had to flee the country for his activities against partitions of Poland. It speaks about the experience of emigration and hope for a better future for those who have been forced to leave their country. – National symbols are worth anything only if they are alive, if people do not forget what they are supposed to mean. Respect for national symbols is not worth much if we do not know what these symbols are supposed to be about. My version corresponds to the spirit of the original anthem – says Kapela. The prosecutors and the courts have not been as eager to prosecute in other cases of apparent disrespect of the national symbols. Other remakes of the Polish anthem have not been an object of such thorough prosecutorial scrutiny. Polish law does not allow the selling of merchandise with the Polish flag or Polish coat of arms on but nobody has been prosecuted for making money on patriotic wear. This shouldn’t be surprising, however, because President Andrzej Duda himself has a t-shirt from one such company. The law enforcement seems also to be OK with Kotwica (a letter “P” stylized as an anchor, a legally protected symbol of Polish resistance against the Nazis during World War II) being put next to the symbol of SS Totenkopf. This, by the way, is a true story: pictures of young men wearing both Kotwica and the SS skull were taken during a march organized by the neo-fascist organization ONR, which was celebrating Polish guerrilla fighter Romuald Rajs, whose unit massacred Polish-Belarusian civilians during WWII. The march took place in Hajnówka, a village in the region where Rajs carried out these massacres. But again, this should not surprise anybody: Rajs is one of the “cursed soldiers” who are celebrated as freedom fighters by the incumbent government. Rajs is one of the “cursed soldiers” who are celebrated as freedom fighters by the incumbent government. According to the same statute which was the basis of Kapela’s conviction, drawing or writing anything on the national flag is also classified as disrespecting a national symbol. – Members of the extreme right who do this are not convicted or even prosecuted – says Kapela. – This is a selective application of law that is supposed to create a very nationalistic vision of the state – he adds. While Kapela’s case seems to be exceptional when it comes to protection of Polish national symbols, it seems to be an element of a different and broader pattern. At the end of February comedian Klaudia Jachira was questioned by prosecutors. She has been known for some time for criticizing the current government and mocking the chairman of the ruling party, Jarosław Kaczyński. She has participated in anti-government protests and has her own YouTube channel with more than four thousand followers. Now Jachira is accused of violating copyright laws in her satirical performances. Specifically, she is accused of the illegal distribution of someone else’s piece. The copyright law was intended to prevent people from profiting from “piracy” of intellectual property and the violation is punishable by up to two years in prison. According to the prosecutors, the pirated piece was the public broadcaster’s logo. – Poland has to be a very happy place if artists are chased for this sort of things – Jachira said ironically in one of her interviews. Jaś Kapela and the court. Photo by Jakub Szafrański. In the summer last year the police justified the use of force against a participant of a protest by stating that he interfered with a legal demonstration. How did he do it? According to the official report, it was by shouting “Lech Wałęsa,” – the name of the former president of Poland with whom Kaczyński has had a bitter feud since the early 1990s. The demonstration that he interfered with was a monthly commemoration of the 2010 Smoleńsk plane crash that killed Lech Kaczyński, the then-president and twin brother of the chairman of the Law and Justice Party. In December 2017 the National Broadcasting Council was issued a PLN1.4 million fine (more than 330 thousand euros) for reporting on protests in December 2016, when the parliamentary majority unconstitutionally pushed through the budget. The Council argued that since protests took place without proper legal permits, the reports were, in fact, propagating illegal activities. What unites these cases is the arbitrary application of the law against politically inconvenient individuals and entities. It is true that Kapela’s fine is not very high and that the egregious decision of the National Broadcasting Council has been waived –ultimately the point is not to punish crimes but to send a message. The absurdity of the charges – does anyone believe that inviting refugees to Poland actually insults Polish national anthem? – only underscores the abusive character of actions by public authorities: they are not supposed to enforce the law but discourage opposition by showing potential costs of political dissent. Does anyone believe that inviting refugees to Poland actually insults Polish national anthem? The incentives for self-censorship are even greater in the context of recent changes to the judiciary. A statute implemented in summer 2017 allows the minister of justice/the prosecutor general to sack the chief judges of all lower courts. Purges of politically insubordinate judges are under way. Other statutes which went into effect in January, give the parliamentary majority the power to select the members of the National Council of the Judiciary and thus indirectly judges of all lower courts. The ruling party also filled the High Court, the ultimate appellate court for criminal cases. Jaś Kapela, the dangerous poet.